The combo update is just over 1GB. Is that what you downloaded? That would explain the size. Mine was 4XX as well, odd, it had all the updates before that. I wonder how people got just 275? The 10.6.8 update on my Quad Pro has killed Time Machine backups (backup drive suddenly seen as Read Only), blocked App Store updates (privilege issues), and blocked moving old iTunes TV files to the trash ("because files can't be deleted"). Surely everyone knows that OS updates via Software Update are sized according to what Mac+OS you're running, and that the Combo Updates downloadable directly from Apple's website are able to update any Mac? In my experience, Combo Updates are much more stable. I never update via Software Update unless that is the only option. Thankfully, most updates are available via Apple's Support pages. Alas my OWC SSD has not had trim support enabled. I suppose it is only enabled for certain approved SSD drives. I've been running an OWC Mercury Extreme SSD, used trim enabler and I've had no issues. Not according to licensed developers who actually know what they are doing. Note, after applying 10.6.8 I had to re-enable trim support with trim enabler. All seems well. Hmmmm. Sounds like Apple is working on two of the components that could make iCloud more robust. IPv6 for "tunnelling" through firewalls and point-to-point communication between any of your iDevices and Macs (or even pee cees.) VPN for secure access to your data on, say, Apple's iCloud data center in North Carolina. Even from unsecured public wi-fi hotspots. Thanks for that response. I did a search and it seems that some people have had some problems so I might hold off and see what Lion brings. Not sure what ADC requirement you might be referring to. It is public knowledge that anyone who wants to spend $99 can sign up for the developer program and get access to Lion. All software has bugs and Apple has announced a July release. So what has been revealed that is not already public and stated already by Apple? Mmm... no. Lion still has its fair share of bugs. I JUST had this happen to me. DP4 Update 1 and iTunes 10.5. Tried to watch an MP4 movie that has always worked before. I had previously done a "Get Info" on it to change the artwork. Artwork disappeared and refused to be replaced. Then when I tried to play it, this happened. This might not be a bug, though. 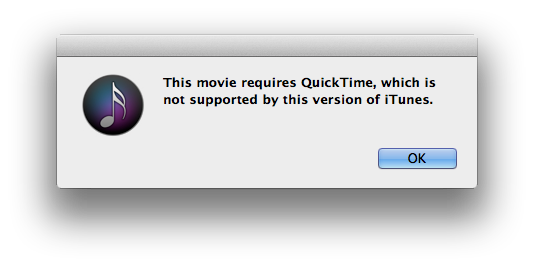 Apple might actually be discontinuing QuickTime entirely and letting iTunes handle media. You never know. In regards to 'OrinalMacRat' I couldn't understand the criticism. Lion is buggy and it will likely be released the 2nd or 3rd week, so what's the problem? He was correlating releases of Snow Leopard to releases of Lion previews, and they have nothing to do with one another.